Recently, I received a wireless thermometer from Thermoworks to try out. Their newest product is called Smoke and is specifically designed to help people barbecue and smoke food at home. 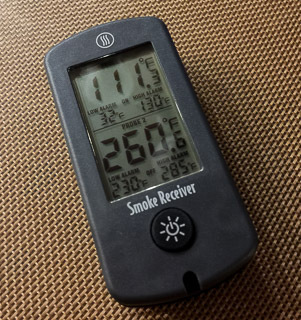 Smoke has two parts - a base unit (which takes two of Thermoworks standardized Pro-Series probes) and a wireless receiver unit - which lets the user track the air temperature and the food temperature without going outside to the smoker. 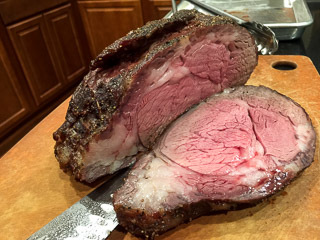 As I am writing this, I've got a brisket in my Big Green Egg. It's been about six hours, and the internal temperature is 165.7°F. 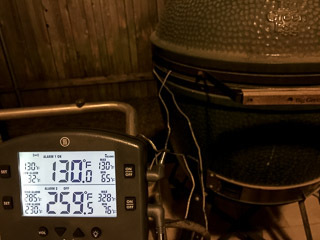 The temperature in the Big Green Egg is 277.6°F. 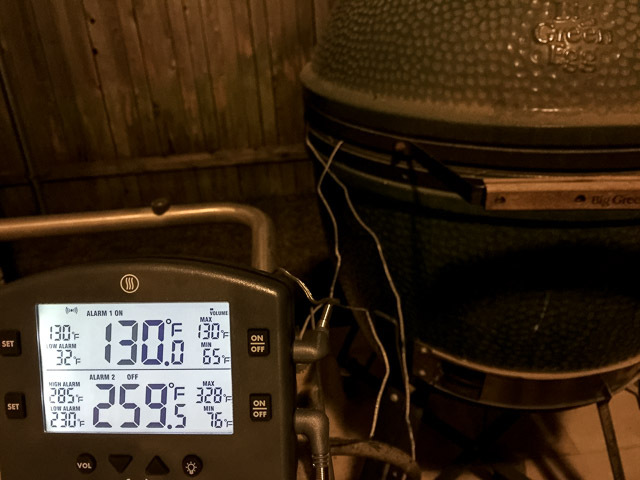 All I had to do was glance at my receiver unit instead of having to get my shoes, go out the backdoor to look at the thermometer in the lid of the Big Green Egg (which I have discovered is ridiculously inaccurate), open the lid, and then stab the brisket with a Thermapen. In the past, I didn't really think it was a big deal to go outside and check once an hour or so, but there really is a big difference in convenience when using a remote thermometer. Being able to just glance down and see that everything is going okay (and the fire hadn't gone out), dramatically reduces the background stress involved in long barbecues (which I didn't even know I was experiencing until the stress was removed). In the past, I would smoke something every few months, but in the last week, I've already smoked a rib roast, cabbage, two whole chickens, and, now, a brisket. The only thing that would make this even easier would be a temperature controlled smoker, but, since I don't barbecue regularly, I doubt I will ever buy one since I have limited space outside. 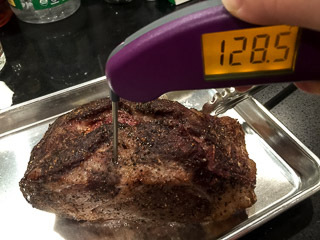 The Smoke works very well as a thermometer with temperature readings accurate after just 4-5 seconds (on par with the DOT and ChefAlarm products and almost as fast as the Thermapen) which is more than sufficient for a probe that is staying in the environment it is measuring (as opposed to an instant read thermometer where speed is much more important). 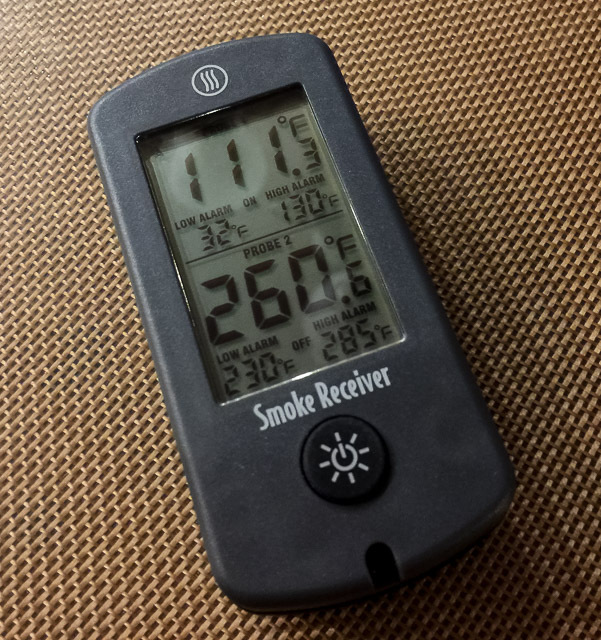 The accuracy of both the probes that come with the Smoke (a Pro-Series High Temp Cooking Probe and a Pro-Series High Temp Air Probe) match that of my Thermapen and Air Thermapen, so there's no doubt the readings during my barbecue are correct. 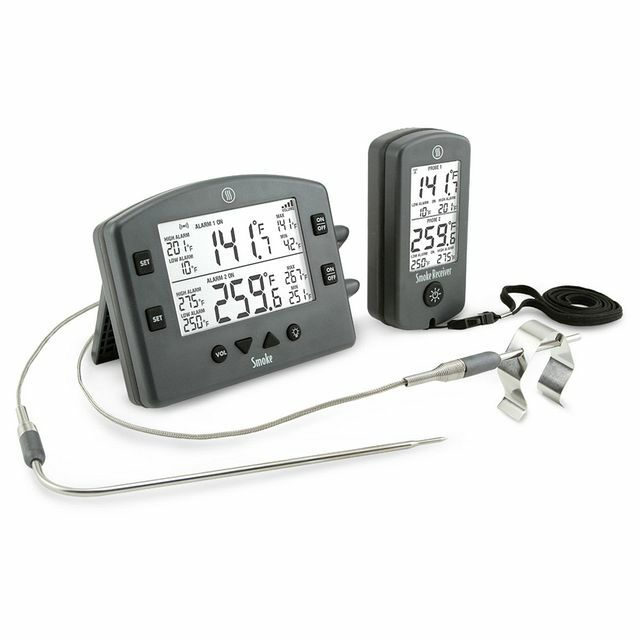 There are plenty of wireless thermometers available on the market, but this is the first time Thermoworks, a company I trust for almost all my temperature measuring needs (from data logging to instant read probes), has made a unit specifically to help with outdoor cooking. These days, I reach for a DOT when I want to do a roast in the oven because the alarms are easy to set and the display is large and easy to read. The Smoke is just as easy to use and uses the same probes, so it's great if you own more than one Thermoworks product. I did find that the receiver updates lag the main unit by about 15 seconds. For long cooking times that this device is intended for, that's not a big deal, and I didn't mind. The alarms can be set on each probe and can be set with a different minimum and a maximum temperature for each probe. This is really useful to alert the user when the food hits the target temperature or if the heat drops below the desired cooking temperature or rises too high. It works as advertised with the main unit beeping as well as the receiver, so there's no way to miss it. However, I discovered that clearing the alarm on the receiver unit did not stop the alarm on the main unit. Since I had a tendency to not be able to run outside immediately after an alarm went off, I found that the main unit would be beeping the entire time (and potentially bothering neighbors even on the lowest volume setting). 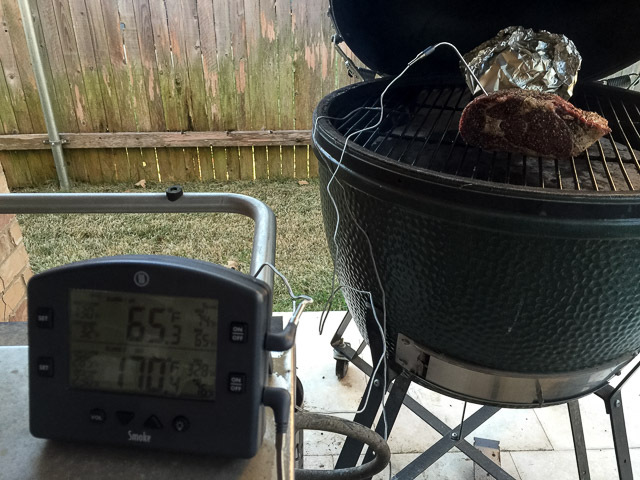 Since I wasn't actually hanging out outside, I realized I didn't need the main unit's alarms, so, after smoking the rib roast, I opted to just set the main unit on mute. With the alarms set and the remote receiver unit with me, I never had to remember to check the receiver for the cooking temperatures since I could rely on the alarms to let me know when I had to do something. The alarms even have different beep patterns so you know which alarm is going off (beep-pause beep-pause for the first probe and beep-beep-pause beep-beep-pause for the second probe). I couldn't ask for more in a wireless probe thermometer (except that the main unit alarms should stop if I clear it on the receiver). The Thermoworks Smoke comes with the AA batteries it needs (2 in the main unit and 2 in the receiver), a Pro-Series High Temp Cooking Probe, a Pro-Series High Temp Air Probe, a grill clip to hold the Air Probe in place over your grill, and a lanyard for the receiver. Thermoworks is selling the Smoke at $99 and this would definitely welcome tool for anyone who likes to slow cook food outside. I have one of these and can confirm it works great. Good quality materials, highly accurate, easily readable. The remote comes on a lanyard to hang around your neck.